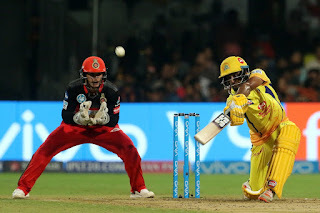 Batting First RCB Put a Huge score Put on the Board for CSK. They Make 205 in 20 overs losing 8 Wickets. De Kock and Virat Kohli Open the Innings. Kohli out early. ABD came first down and build a solid partnership with Team Mate DE Kock. They build 100 plus partnership in just 50 Balls. De Kock Made 53 in Just 37 balls, while ab scored 68 in 30 Balls. He is the Highest Run Scorer and holding Orange Cap. Bravo Got the Break for CSK after dismissing Dangerous De Kock with Caught and Bowled. Imran Tahir Took two Crucial Wickets. In the Death Overs, Mandeep Singh scored some solid shots and Passed the score Over 205. Thakur, Bravo, and Thahir Took two wickets Each. Chasing the big total CSK Opened their innings with inform batsman Rayudu and shane Watson. Shane Watsons Got out in first over after hitting One big Six. Chahal Took Two quick Wickts, Chennai is in trouble to chasing down the Total. They Were 90/4 after 11 Overs.